Anyone who has been wakeboarding will know how much of a thrill it is. They will also know that you need to be protected by the best wakeboard life jacket due to the speeds that you will be traveling at and the high impact you can have with the water. To make sure that you are able to choose the best wakeboarding life jackets for you, we have developed a buying guide to give you all the information you need. We have also completed wakeboard life jacket reviews to show you the best products on the market and once you have finished reading this, you’ll know exactly what you need. 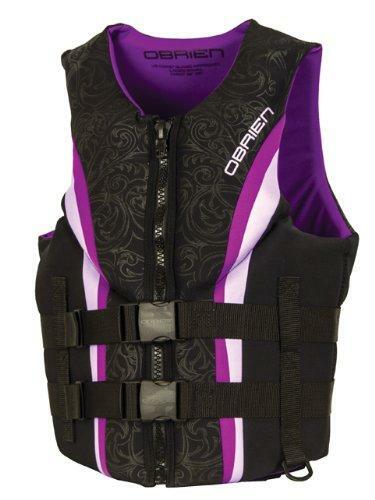 This is a top rated wakeboarding life jacket from O’Brien with a long list of great reviews. It is perfect for women with a stylish design and is available in a great range of different sizes. It has a neoprene outer that is going to give you a lot of durability and also a comfortable fit. It has a two buckle closure and a secure zip for a secure fit. 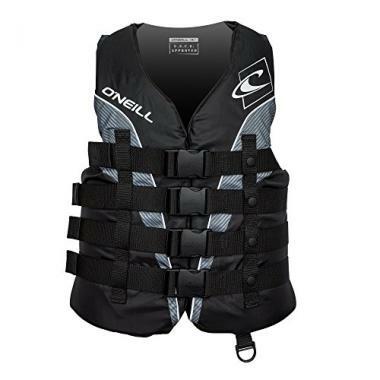 O’Neill are a company known for their great products and this wakeboarding life vest is another great example. This is a life jacket for men and one that is secured by four straps across the chest that are adjustable to give you a great fit. It has a minimal bulk design to give you the fullest range of mobility and it is very lightweight too. This wakeboarding PFD from Stearns is a great product and one of the best on the market. It is another one that comes with four straps to give you the highest level of security. It is US Coast Guard approved and is great for all watersports. It is highly durable and going to be able to take high impacts while still being comfortable to wear. Wake boarding life vests have to be made with the highest quality to withstand the impacts they have and this product delivers exactly that. It is also stylish and therefore you’re going to look great while you are out there on the water. It has a segmented foam core to give you a high range of flexibility so that your movement isn’t restricted. 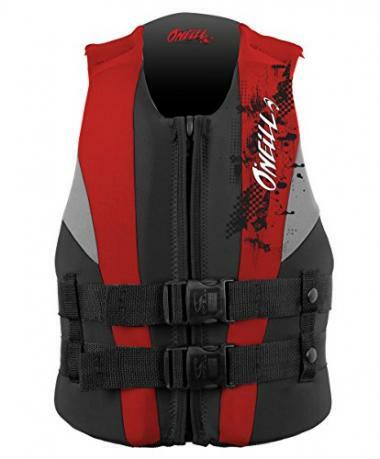 This is a great life vest for wakeboarding that not only performs well but also looks great too. It has a very thin profile which makes it perfect for anyone looking for the maximum level of mobility. It is made from very light materials and therefore it is going to be very comfortable to wear, even for extended periods of time. 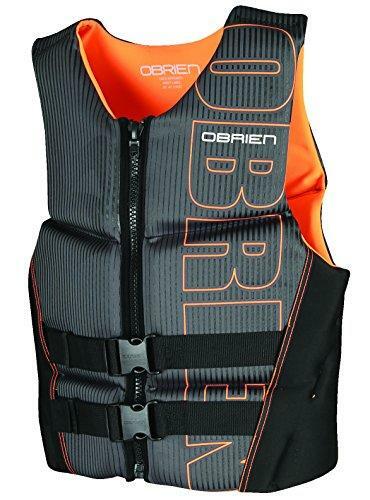 This wakeboard comp vest from O’Brien is made from the best materials to make sure it delivers to the highest possible standard. It has a classical design with two large buckles across the waist and also a strong zip through the middle. Your movement won’t be restricted and like all of the jackets in this list, it is approved by the US Coast Guard. 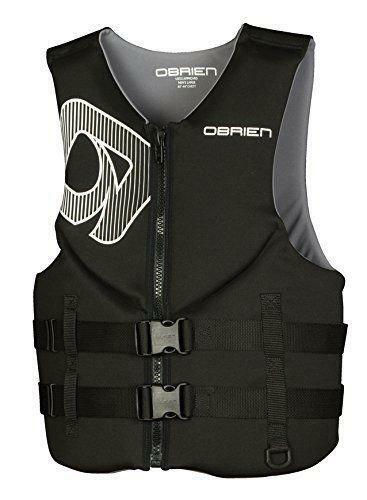 This product from O’Brien would make a great competition wakeboard vest due to its high-quality design and the materials that have been used. It has segmented panels that are not going to restrict your movement when you are out there on the water. It is made from neoprene so you know that jacket is going to be lightweight and comfortable. 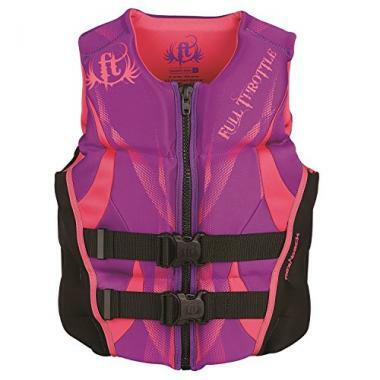 This is a bright and colorful life jacket that is available in either color of blue or purple, depending on your preference. That jacket has multiple hinge points to give you an added amount of flexibility with your wakeboarding. It has soft and light flotation foam that is going to be highly comfortable then you are wearing the jacket. If you’re looking for a jacket for one of the kids then this is going to be ideal for anyone who is between 50-90 pounds. It will allow for a high amount of flexibility and a free range of arm movement. It has quick-release safety buckles and a heavy-duty front zipper for added security. It has a minimal bulk design which helps movement but also makes the life jacket light and comfortable. 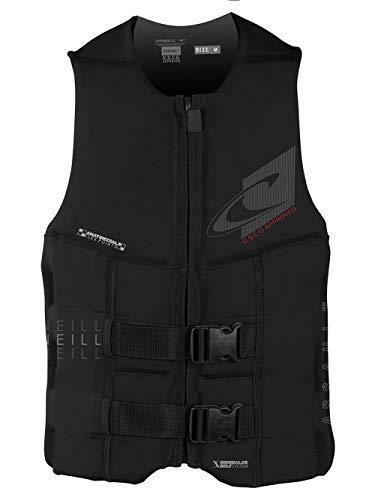 This is a life jacket that is going to be great for waterskiing but it’s also going to be ideal for all watersport activities too, including wakeboarding. It is another jacket that has a segmented core and is made from lightweight and breathable materials. It has quick-release buckles for added safety and it going to be very easy to wear for a full day. The size and fit of your life jacket are going to play a crucial role in your decision making. There are two reasons why getting the wrong size would be a terrible idea and they are the fact that it would be uncomfortable but it would also be dangerous too. If you’re looking for infant life jackets or life jackets for kids, then it’s best to look specifically for them as these products aren’t going to be suitable. Also, it’s important to appreciate the difference between men and womens life jackets due to the requirements involved, but both types are covered here. The fit is more important with wakeboarding life jackets than with other types of jacket due to the higher impacts involved. When you hit the water, you need to know that the life jacket isn’t going to come loose and also that there is no potential for it slipping over your head. It’s a good idea to double-check that you are going to be getting the right size for yourself and check the measurements on product details. 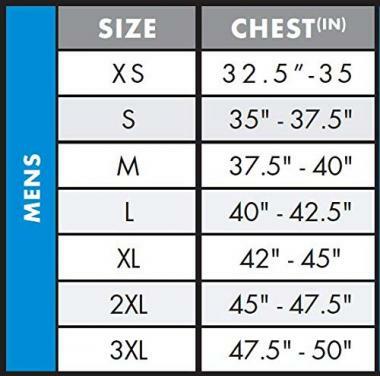 This is going to be easier if you are regular sized and are getting a universal fit but if you are particularly large or petite, this is going to be more important. All of the life jackets that we have looked at here are made out of high-quality materials but some are higher quality than others. It’s important that they have a high level of durability and also that they will be comfortable enough too. Polyester and nylon are two materials that have been commonly used in the making of water sports equipment and they are able to have all those qualities. They can be made water-resistant and are both going to be great choices for your wakeboard life jacket. In term of the best material for life jackets, then that is going to be neoprene. It has all these features that nylon and polyester has but it also has a natural level of stretch to it which means that it has a higher level of comfort than other materials. Whether you’re caring for your pets with a dog life jacket or need a fishing life jacket, most people want to have a bit of style to the products that you buy. Despite being a safety product, there can be a lot of difference from one jacket to the next. One of the first things that you need to consider is whether or not you want to get a zipped up life jacket. There is little difference between the two and it depends on what you’re most comfortable. A zipped up life jacket will still have buckles on it but usually less than a non-zipped life jacket. Also, all of these jackets have an open design but some have a lower profile and more open arms than others. These will be able to offer you slightly less support than other jackets but will be able to offer you more freedom of movement and flexibility. Q: What Is A Wakeboarding Life Jacket? A: A wakeboarding life jacket, unlike a regular life jacket, has to be able to cope with a number of different things. That is due to the speed that you will be traveling at and also the need to have a full range of mobility when you are out there. 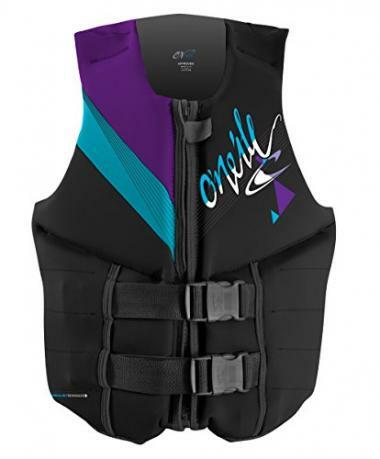 Due to these factors, you want to have a life jacket that has a slim profile and wide open arms in order for you to be comfortable while you are wakeboarding. That will ensure that you are able to do all of the moves that you want to do without being restricted. Q: If I Fall Will The Life Jacket Keep Me Floating? 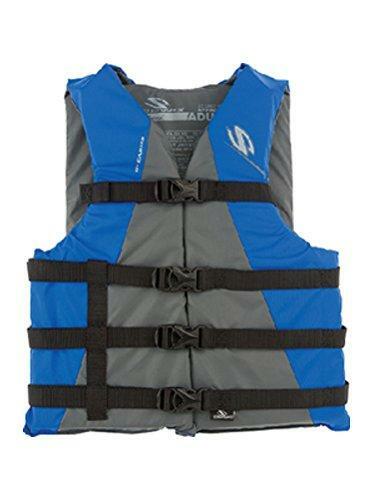 A: With life jackets for water sports, they need to be able to offer you a lot of movement. There are five different types of life jacket that are available to purchase that are able to offer different levels of protection with Type I and Type II being emergency devices that you will usually find on ships. The life jackets that we have shown here are Type III jackets and they aren’t going to give you the same level of protection as the first two. 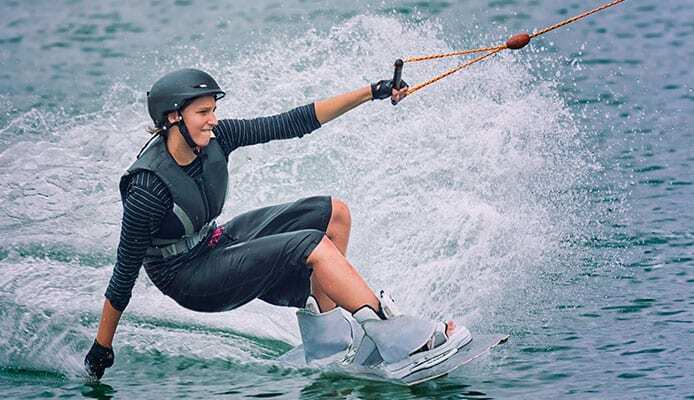 The reason for that is due to the fact that they have floats behind the head and are a lot bulkier, and this isn’t ideal for a sport like wakeboarding. Despite that, all life jackets that have been approved by the US Coast Guard are going to be able to give you a high level of protection and ensure that you float. Type III jackets are still going to be able to give you a huge amount of support and are ideal for the situation that you are going to be in. Q: What Are The Main Differences Between A Wakeboarding And Jet Skiing Life Jackets? A: There are many different types of life jacket out there, such as sailing life jackets, life jackets for kayaking and they even do inflatable life jackets. This is because they have different requirements placed on them and need different levels of flotation. The requirements on a wakeboarding life jacket and a skiing life jacket though are going to be very similar. They both need to give you a high range of mobility and they both need to be able to cope with a high level of impacts. Due to that, there aren’t going to be key differences between the two types and the same jacket will be able to be used for both types of water sport as well as other activities too. Getting a high-quality life jacket will be able to give you many different uses when you are out on the water. A good life jacket is going to be essential for many activities when you are out there on the water. You want to make sure that you are protected to the highest possible degree and therefore getting the highest quality life jacket is going to be vital. Getting the right size is always going to be crucially important as a bad fit will be highly dangerous. Thankfully these jackets have a very high level of adjustability to give you a close fit and ensure that the jacket won’t slip off when you find yourself in the water. After you get the right size, choosing the material and the style is going to be important. You want to look good while you are out on the water but you also want to be as comfortable as possible, and getting the best life jacket will ensure that. Hopefully, this guide is going to be able to give you all the information that you need in order to choose the best wakeboard life jacket for you. Once you have, you will be able to enjoy spending time out on the water knowing that you’re going to be as safe as possible.